Food Wishes Video Recipes: Olive Oil Poached Tombo Tuna – Do you have the courage to submerge? Olive Oil Poached Tombo Tuna – Do you have the courage to submerge? Most people think of poaching as simmering something in a stock or wine, but today I’m going to show you a new way to poach; in an infused olive oil. There are countless combinations of times and temperatures for the oil and tuna. You can use my video as a general guide for the procedure, but it may take some experimenting to get “your” version perfect. As you’ll hear me say in the demo, this is more of an idea, than a recipe. After watching, I want you to try this with different combinations of oil flavorings and spice rubs, and of course, report back to the rest of the viewers. The method is basic. 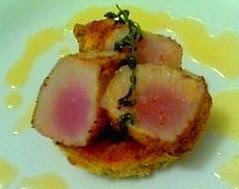 Infuse some garlic and herbs in a nice olive oil, and then gently poach the spice-rubbed tuna in this delicious bath. I cooked mine sort of medium-rare-medium, so there was a bit of pink inside. But, if you like you tuna cooked all the way through, that’s OK, you’re not a bad person. As you watch this recipe don’t worry about all that oil, since it’s just used to cook the fish in, and very little actually makes it onto the plate. Another trick with this method is to add the tuna to the hot oil, and then just turn it off and let it cool in the infused olive oil. You can then store the tuna and oil in the fridge and use it to crumble over a salad. You may never use canned tuna again! This is referred to as “tuna confit” by some. By the way, Tombo tuna is also known as Albacore, which is the type of tuna most commonly canned. It’s also easier to find, and cheaper, than Ahi, which is that dark red fleshed tuna you’ve seen me use before. God, that looks tasty! So does the cake thing under it. hey - loved your recipe - for ecological reasons, can i switch the Tuna with Salmon? Made this twice already. I make Laura Vitale's tuna salad sandwiches with it. Outstanding! Hey Chef,I was wondering how long the tuna will keep stored in the o/o in the fridge. Thanks. Everyone remain calm…this is only a Test! Lost in Translation? We’ll take that chance!